Provides natural antioxidant and liver-protective ingredients. Promotes the elimination of heavy metals. ¤ Picrorhiza kurroa extract (4 % kutkin) stimulates liver regeneration in rats. It also has a dose-dependent choleretic effect. 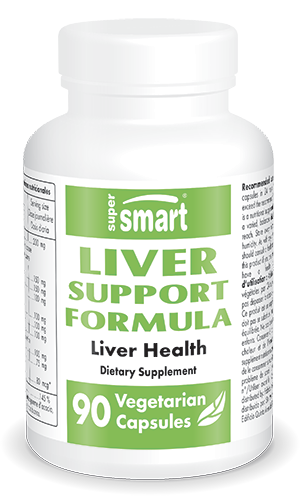 Animal studies suggest that it is effective at protecting the liver from biochemical changes caused by numerous toxins. ¤ Artichoke leaf extract (5 % cynarin) has antioxidant and liver-protective properties, as shown in animal studies. It improves bile flow and stimulates regeneration of liver tissue. It was shown to reduce liver damage in rats poisoned by carbon tetrachloride. It prevents cell necrosis which generally accompanies oxidative damage. ¤ Silymarin, extracted from milk thistle, is used to treat a large number of liver problems including cirrhosis, alcoholic steatosis, poisoning of the liver and viral hepatitis. Silymarin increases levels of glutathione and glutathione peroxidase in patients with liver disease. It is also a potent antioxidant. ¤ Methionine plays a crucial role in the synthesis of S-adenosylmethionine (SAMe). The latter supports liver production of glutathione, the liver's foremost antioxidant protector. SAMe stimulates detoxification and regeneration of the liver. ¤ Sodium R-lipoate, an R-lipoic acid salt, has excellent bioavailability. Alpha lipoic acid supports liver function by neutralising free radicals and stimulating production, regeneration and concentration of glutathione in the liver. Alpha lipoic acid is a phase II enzyme-inducer. It also stimulates bile excretion of heavy metals and encourages glutathione production. ¤ Ginkgo biloba extract has antioxidant and liver-protective effects. In studies on rats, it was shown to inhibit hepatic fibrosis. ¤ Selenium provides the liver with antioxidant protection, and acts via different mechanisms to protect the liver, in particular, in combination with detoxifying enzymes and via anti-inflammatory effects. ¤ N-acetyl-cysteine boosts glutathione production and protects against toxins. ¤ L-citrulline, a non-essential amino acid and metabolite of the urea cycle, facilitates detoxification of the liver. Adults. Take three capsules a day or as recommended by your therapist.